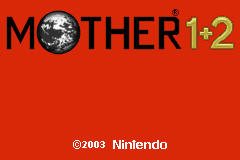 Mother 1+2 is a compilation of two role playing games for the Game Boy Advance. This is the first two Mother games. 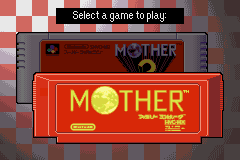 Mother 2 was released here as Earthbound on SNES. The first game is available in English as an NES prototype. 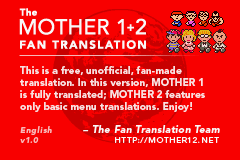 This is a complete translation for Mother 1 only. Mother 2 features minimalist menu hacking so that players already familiar with EarthBound can still play. Tomato added an “Easy Ring” in the hero’s room in Mother 1, so players can optionally double the EXP and money received from fights. Jeffman had been working on the Mother 2 portion of the game, but Tomato said he doesn’t have enough time and energy to tackle programming and translating the Mother 2 portion (as difficult as his Mother 3 project). He did say the two are almost independent programs.